The Music Director Designate of the St. Louis Symphony Orchestra, Stéphane Denève, is in town through February 17 for to conduct a pair of concerts. Despite a busy rehearsal schedule, he has been doing media interviews to promote the 19/20 season (in which he will officially become the orchestra's Music Director), and I sat down to chat with him and SLSO Vice President--Artistic and Operations Erik Finley. Here's a transcript of our conversation, minus some edits for clarity. Chuck Lavazzi (CL): We've been reading a lot about what will be new next season, but let's talk for a minute about what's not going to change. What will people find familiar next season? Stéphane Denève (SD): That's a good question, actually. Obviously the orchestra is part of this community but every conductor shapes the sound of the orchestra instantly. That's why you have some good concerts and some less good concerts with the same orchestra. In a way, I hope that all of my concerts will reflect on what I am and what I have achieved during my eight visits before. So I think what they can expect is to see a continuation of what I built with the orchestra--which is very good, because I'm not arriving totally new. Since 2003 I have really built a relationship with them of trust and mutual love. The quality of the hall will be the same as well. I adore the acoustic of this hall. So that will be the same, but I hope everything else will be different. Erik Finley (EF): I understand you're also continuing a long-standing commitment to American music, even to the point of inviting John Adams. SD: Yes, the legacy of the orchestra is very much respected in my first season. I admire what the American conductors--Leonard Slatkin and the David Robertson--did for the orchestra. I happen to love this country and I am probably one of the most American of the French conductors because I have worked a lot in this country for many years. So we will perform a lot of American music and a lot of music of our time. CL: Speaking of new music, what are the criteria you use in deciding what new works to present? SD: It's a very simple and very genuine thing. I ask myself, do I love them? Because I feel that nobody should ever conduct music that he or she doesn't believe in. Because music is about passion. It's like you're a chef and you have a wonderful meal and you want people to eat it. You want them to enjoy it as much as you do yourself. CL: Because a chef wouldn't cook something that he wouldn't eat himself. SD: Yes, that would be very weird. And I really believe that's crucial, especially for new music. It's very important that the audience understand that the new music we will perform is music that I believe they can love. It is true that my preference is for music that is very emotional, that is often very tonal and that has a lot of melodies. I think that the Holy Grail of music is the tune, the melody. I'm a lyrical conductor. I started my career as an opera conductor and I love lyricism and so the reason I conduct a piece of whatever repertoire, old or new, is because I believe in it. Of course, the danger when you do a premiere is that you may love the style of the composer but every composer--it's a fact--can write a bad piece. So there is a risk taken when you do a world premiere. But when I conduct something, it's because I believe in it. CL: So it has to speak to the heart as well as the head. SD: Yes, it's not one or the other. All the masterworks of music, for me, have this power to speak to everybody. For instance Mozart's "Magic Flute" can be enjoyed so much by kids. Every Papageno of this world, every Tamino of this world, or every Zarastro of whatever age or knowledge or spirituality you have, there is something to be inspired by in "Magic Flute." For me a masterwork is something that has that power. So I really don't see a dichotomy of between something that will speak to your brain or your heart, it has to speak to both. And it is something of a cliché that modern music is not accessible because it's complex. I find this to be very weird and wrong because complexity for me to be able to find two notes that give a full presence. Like the music of Shostakovich or Arvo Pärt that has no accompaniment and just a simple melody can still be, for me, extremely complex because of that. Because it's magic how much something can have a soul presence in a pure, simple form. What is important is that I am a musician. I love music, it is my life, and so I pretend pretentiously that I can judge if your music has substance, and as long as I believe in that substance, then there's nothing simple or complex, it's just good. CL: Yes, I think it was Duke Ellington who said there are only two kinds of music, good music and bad music. SD: There's a joke in France that there's only good music, bad music, and music by Ambroise Thomas--which is neither. CL: One of the interesting things you're doing this season is the "symphonic play" by Didi Balle, "Maurice Ravel: A Musical Journey." Can you tell me a bit about that? You did the world premiere of that last year. SD: Yes, we created that together. I love that writer. She's very good at this kind of "edutainment" thing--both very informative and very pedagogical in a way, but which is so much fun and has such a great sense of drama. So it's really a very good balance. And I'm really very proud of this project because it's a multimedia project with projections, actors, and soloists. So you have a journey into themes connected with Ravel's music andit's very unique as an art form. It's not a concert and it's not a play, it's something in-between. I think it will be fun to bring that here. The audience will hear a lot of Ravel's music. There will be an actor on stage who actually looks quite a lot like Ravel. They can expect to learn a lot about the context and really enjoy it because it's full of emotion. It's all about the great mystery of the relationship between the work of a man and the man himself. It's always interesting to see the reality of the human being behind so many masterworks. Sometimes, since we play so many pieces from the past, we forget this link, which I think is fascinating. CL: I see that you have programmed a number of ballet scores. In the past the symphony has sometimes used visuals with those. Will you be doing anything like that? SD: No. It's very interesting, because as much as I love combining art forms I'm very doubtful about the visual and the music together. There have been some experiments in which that has been successful. But somebody I love, John Williams, told me that music can never win because the visual is so distracting and so prominent. So every time you have a visual which is very powerful the music tends to become an accompaniment. And therefore it's very hard to find the right balance to make that successful. In the case of "Rite of Spring" I think the music is so extremely powerful I doubt that there is anything that cannot detract from the music except, of course, a live performance of the ballet. Not so long ago in Paris I saw a ballet based on (Ravel's) Concerto in G that Jerome Robbins did and I thought it was complicated because it becomes something else, it becomes ballet music and you listen less. It can give you some other type of emotions. A lot of people say today "oh, well, you live in a visual world" and so we have to give the audience something to enhance the experience. And I don't want to appear to be a Puritan or austere, but I think the opposite. I think this is our chance to offer something different. I think that music has the power to bring us together through the sheer power of the vibration. And it does something strange. Have you noticed, for instance, when somebody makes music well, this person becomes beautiful? I mean, you can be objectively not beautiful, nevertheless the music has the power to make you look at an artist for an hour or two and never question the look. This is one of the many powers of great music. You know that word is an adjective, belonging to the Muses, and I think it's the super art, more inspiring than anything else just because of vibration in the air itself. CL: Music is itself and doesn't necessarily need anything else. SD: Unless it is designed that way, I think. But I have seen (Smetana's) "Ma Vlast" ("My Homeland") with photos, or a video DJ mixing abstract images live with music. I did an experiment in Scotland some time ago where we had projections with the music and every time I felt doubtful that this was successful musically. It was entertaining but did we serve the music more? I don't think so. CL: I notice you have really interesting things coming up for the chorus as well: Mozart's C Minor Mass, Vaughan Williams's "Dona Nobis Pacem," and Berlioz's "Damnation of Faust." That last one is a pretty big undertaking, isn't it? SD: Yes, it is really a genre all by itself, because it's not really an opera but at the same time it really wants you to imagine, so I would say it's almost psychedelic. It's extremely evocative and it's so powerful and it's very difficult. 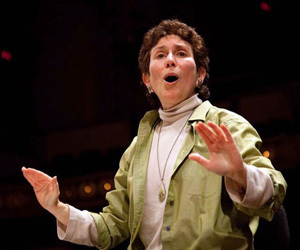 I feel very confident because before I was even considered by this orchestra I conducted a big masterwork for chorus here--"Daphnis and Chloe," the full ballet--and I was so impressed by the quality of the chorus and by the work of Amy Kaiser. For me the full family of the (St. Louis Symphony) Orchestra is extremely rich. There is the orchestra, and the St. Louis Symphony Chorus, and the IN UNISON, and so many activities for the kids. It's huge. And I love vocal music. As I said before, I come from the opera world and I love to do opera in concert. That's why I feel very confident to program big works. I will do the Mahler Second. CL: Another favorite of mine. SD: Yes, it's fantastic. And also the Beethoven Ninth in my first season, so I'll have the opportunity to really develop a relationship with the chorus, and I love that. EF: The cast for the Berlioz is also amazing. To do "Damnation" with you, we would only have done it if we could have found an excellent cast, and we have done that. SD: The cast could not be better, it's amazing. The Marguerite of Isobel Leonard is fantastic. We are in for a special night. I hope people will take the opportunity to see it because it will be an event. 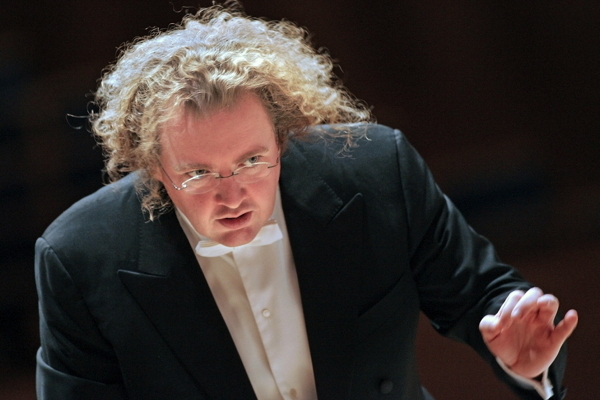 Stéphane Denève conducts the St. Louis Symphony Orchestra and Chorus tomorrow (Sunday, February 10) and again on February 15-17. All concerts take place at Powell Hall in Grand Center.